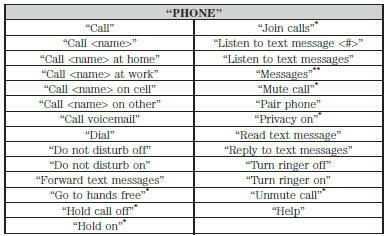 Other features, such as text messaging using Bluetooth and automatic phonebook download, are phone-dependent features. To check your phone’s compatibility, see your phone’s user manual and visit www.SYNCMyRide.com, www.SYNCMyRide.ca or www.syncmaroute.ca. The first thing you must do to use the phone features of SYNC is to pair your Bluetooth-enabled cellular phone with SYNC. This allows you to use your phone in a hands-free manner. Note: Put the transmission in position P. Turn on your vehicle ignition and the radio. 1. Touch Add Phone in the upper left corner of the touchscreen. Find SYNC appears on the screen and instructs you to begin the pairing process from your device. 2. Make sure that Bluetooth is set to On and that your cellular phone is in the proper mode. See your phone’s manual if necessary. • Select SYNC, and a six-digit PIN appears on your device. 3. If you are prompted to enter a PIN on your device, it does not support Secure Simple Pairing. 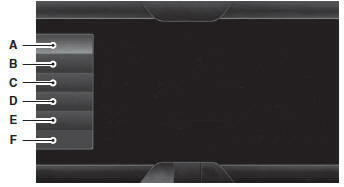 To pair, enter the PIN displayed on the touchscreen. Skip the next step. 4. When prompted on your phone’s display, confirm that the PIN provided by SYNC matches the PIN displayed on your cellular phone. SYNC may prompt you with more phone options. For more information on your phone’s capability, see your phone’s manual and visit the website. 1. Press the Phone corner of the touchscreen > Settings > BT Devices > Add Device. SYNC may prompt you with more phone options. For more information on your phone’s capability, see your phone’s user guide and visit the website. steering wheel controls. When prompted, say, “Call <name>” or say “Dial”, then the desired number. mode, press this phone button. During an incoming call, an audible tone sounds. Call information appears in the display if it is available. Accept on the touchscreen or by pressing this phone button on your steering wheel controls. Reject the call by pressing Reject on the touchscreen or by pressing this phone button on your steering wheel controls. Ignore the call by doing nothing. SYNC logs it as a missed call. Set up favorite contacts from you phonebook or history folder. Touch this button to access and call any contacts in your previously downloaded phone book. The system places the entries in alphabetical categories summarized at the top of the screen. To turn on contact picture settings, if your device supports this feature, press Phone > Settings > Manage Phonebook > Download photos from Phonebook > On. After you connect your Bluetooth-enabled phone to SYNC, you can access any previously dialed, received or missed calls. You can also choose to save these to your Favorites or to Quick Dial. Note: This is a phone-dependent feature. If your phone does not support downloading call history using Bluetooth, SYNC keeps track of calls made with the SYNC system. Send text messages using your touchscreen. See Text messaging later in this section. Touch this button to access various phone settings, such turning Bluetooth on and off, managing your phonebook and more. See Phone settings later in this section. : Downloading and sending text messages using Bluetooth are phone-dependent features. Certain features in text messaging are speed-dependent and not available when your vehicle is traveling at speeds over 3 mph (5 km/h). SYNC does not download read text messages from your phone. You can send and receive text messages using Bluetooth, read them aloud and translate text messaging acronyms, such as LOL. 1. Touch the top left corner of the display to access the Phone menu. Note: This is a speed-dependent feature. It is unavailable when your vehicle is traveling at speeds over 3 mph (5 km/h). Note: Downloading and sending text messages using Bluetooth are phone-dependent features. 2. Touch Messaging > Send Text. 3. Enter a phone number or choose from your phone book. 4. You can select from the following options: • Send which sends the message as it is. • Edit Text allows you to customize the pre-defined message or create a message on your own. You can then preview the message, verify the recipient as well as update the message list. When a new message arrives, an audible tone sounds and the screen displays a pop-up with the caller name and ID, if supported by your phone. You can press: • View to view the text message. • Listen for SYNC to read the message to you. • Dial to call the contact. • Ignore to exit the screen. Note: If you select View and your vehicle is traveling over 3 mph (5 km/h), the system offers to read the message to you instead of allowing you to view it while driving. Touch this tab to connect, disconnect, add or delete a device, as well as save it as a favorite. Touch this tab to turn Bluetooth off or on. Touch this tab if you want all calls to go directly to your voice mail and not ring in the vehicle. When this feature is on, text message notifications do not ring inside the cabin either. Turn on or turn off the 911 Assist feature. See 911 Assist in the SYNC Services and Applications section. Select the ring tone you want to hear when you receive a call. Choose from possible system ring tones, your currently paired phone’s ring tone, a beep, text-to-speech or a silent notification. Select a text message notification, if supported by your phone. Choose from possible system alert tones, text-to-speech or silent. If your phone is compatible, use this screen to adjust your internet data connection. Select to make your connection profile with the personal area network or to turn off your connection. You can also choose to adjust your settings or have the system always connect, never connect when roaming or query on connect. Press ? for more information. Touch this button to access features such as automatic phonebook download, re-download your phonebook, add contacts from your phone as well as delete or upload your phonebook. Touch this button to have the system alert you when your phone is in roaming mode. *This command is only available during an active call. 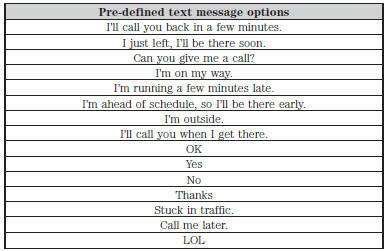 **If you have said “Messages”, see the following “Messages” chart.